New publishing deal lets developer expand the scope of its operation. Games have let players beat the Nazis in countless ways, from organising the entire Allied advance through Europe to shooting Hitler in the testicles. There has yet to be a game that explores the German people’s own efforts to dismantle the Nazi regime from within, however, and that’s the gap which Through the Darkest of Times aims to fill (presumably with explosives). 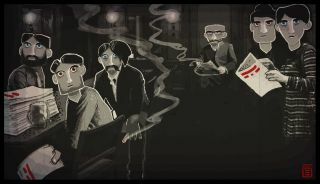 Through the Darkest of Times is a strategy game that puts you in charge of a Resistance group at the heart of Nazi Germany. It takes place through the duration of the Third Reich, from Hitler’s appointment as Chancellor in 1933 to Germany’s unconditional surrender in 1945. Your job is to plan and execute acts of resistance, secure resources for your group and keep the spirits of your members up, all while evading the watchful eyes of the Gestapo. Specific acts you can perform include dropping leaflets to inform the German people about what the Nazis are truly up to, painting messages on walls, and acts of information-gathering and sabotage. Originally announced in April, today developers Paintbucket Games announced a new publishing deal with HandyGames that will allow the company to expand upon its original vision. "The cooperation with HandyGames allowed us to add more depth to the game: more resistance-stories, more content, more endings,” said Jörg Friedich, Founder of Paintbucket Games. “And we have a partner who will make sure the game reaches many players all over the world." There’s a trailer below which elaborates on the concept, although it doesn’t show the game directly in action. I confess I’m not entirely sold on the game’s art-direction, which looks like something from a Russian cartoonist’s nightmares. Nonetheless, it’s an interesting project that I think is worth taking notice of.